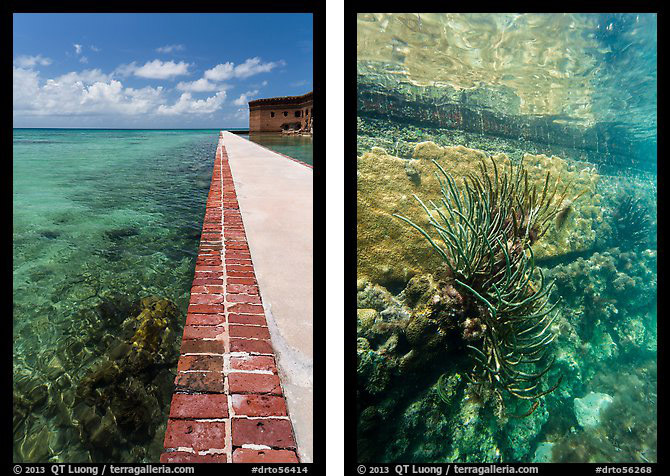 In July, I returned to Dry Tortugas National Park. Considering that I had visited the Park three times before, each visit longer than the previous, and that its main area, Garden Key, has a tiny size of 400 meters by 500 meters, 3 days/2 nights may sound a lot of time to spend, but this turned out to be barely enough to create the new images I had planned. As described in much detail in post #37 of National Parks Photo Spots series, I have photographed one favorite view quite a few times, but had not been successful in capturing it with sunset colors. My first two visits were day trips. On my only overnight stay, a decade ago, cloudy skies meant that the sunset was a monochromatic blue. This time, I got two good chances to create images with a mix of warm and cold hues. On the first evening, the clouds were low, so the color was great looking West, but kind of muted looking North. The second evening was more favorable, so having two chances was useful. Last time I visited, the first full frame digital camera had yet to be released. This time, I felt confident shooting at ISO 3200 on the 5Dmk3, which let me work in the middle of the night. Despite the 1.4 maximum aperture of my 24mm lens, 30s (maximum shutter speed for point stars) were still necessary as the tropical sky was partly cloudy. Fortunately, distant thunderstorms intermittently illuminated the sky. In winter, the seas can be rough. With no waves sweeping over the seawall in the calmer weather of summer, I was able to leave my camera all night with an intervalometer and capture those flashes of light, part of a time-lapse sequence. 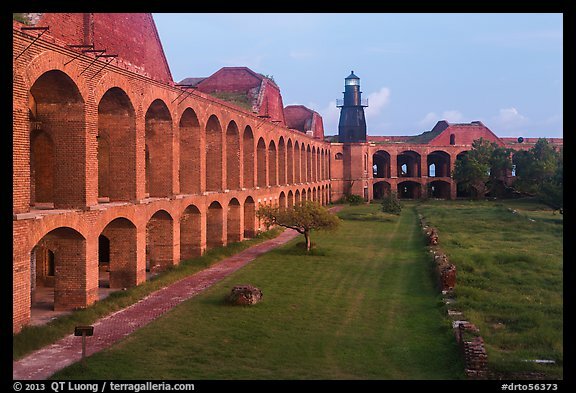 Camping on Dry Tortugas is a wonderful experience. A cluster of trees provide shade for most of the spots, which are only a minute walk from the beach. Because there is no freshwater on the island (“Dry”), there are no mosquitoes unlike on Florida mainland. During the day, up to 200 visitors arrive with the daily Yankee Freedom ferry and the seaplanes. A day visit doesn’t leave much time: the ferry arrives around 10.30, and leaves at 2:45. By mid-afternoon, day-trippers are gone, so that you share the island with at the most one or two dozen campers. In late afternoon, when the light is less favorable for underwater explorations, and the sun less harsh, the fort is deserted. A bit of planning is necessary, since camping there is primitive: facilities are limited to clean chemical toilets, except during the time when the ferry is docked when you can use its facilities and get some iced water as well, and the Fort itself could make for an excellent emergency shelter. Everything you need, in particular food and water, has to be brought, however I had no difficulty handling all my gear, which included a huge duffel bag, heavy Pelican case containing a underwater housing, camera bag, and large cooler. Wheelbarrows are available at the deck in Key West and at Garden Key. The official stated 60 lbs per person luggage limit isn’t really enforced by the Yankee Freedom crew. The only thing I have to warm you is to make reservations for camping transportation well in advance. The National Park will not deny you a camping spot (first come, first serve, stake shady spots quickly ! ), but the Yankee Freedom has a strict limit on the number of campers they will transport on each trip. 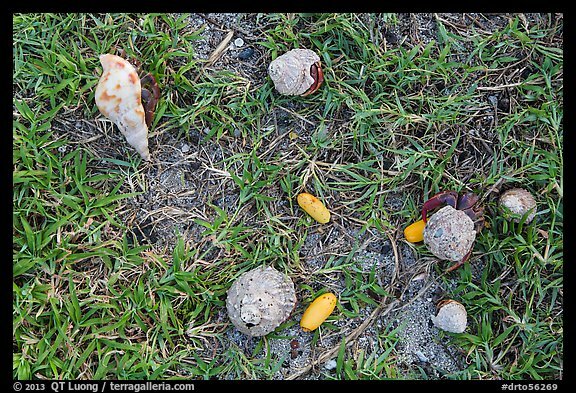 Besides ample time, sunset, sunrise, and night photography opportunities, you get to witness the daily cycles of life on the island, such as thousands of colorful hermit crabs of all sizes and shapes crawling up all the place, even trying to scale trees, in the summer evenings. 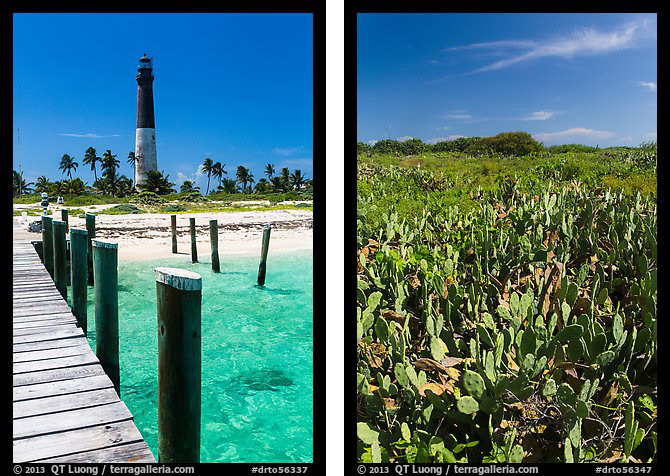 Garden Key is the centerpiece of the park and the only frequently visited key, but of of the seven diminutive Keys that make up the Dry Tortugas, Loggerhead Key is actually the largest. Maybe because it is home to one of the tallest lighthouses in Florida, it appears deceptively close, but is separated from Garden Key by three miles of open ocean. Only a maximum number of 24 visitors are allowed each day on Loggerhead Key, but this number is almost never reached, since there is no public transportation from Garden Key to Loggerhead Key. In winter and spring, high winds make the crossing problematic. I rented a sea kayak in Key West from Marty Stonely, who specializes in renting kayaks to be taken to the Tortugas. Marty arranges for the kayak & gear to be delivered and picked-up at the ferry pier, and also provides safety equipment, including the essential marine radio. After observing the weather patterns on the first day, I became weary of the tropical storms. They could appear out of nowhere, at any time of the day. One minute, you are sweltering under the tropical sun, but before you know it, the temperature drops by 15 degrees, torrential rains soak you, and as you are buffeted by high winds, all of a sudden staying on course and keeping warm becomes a concern when you have no place to hide. 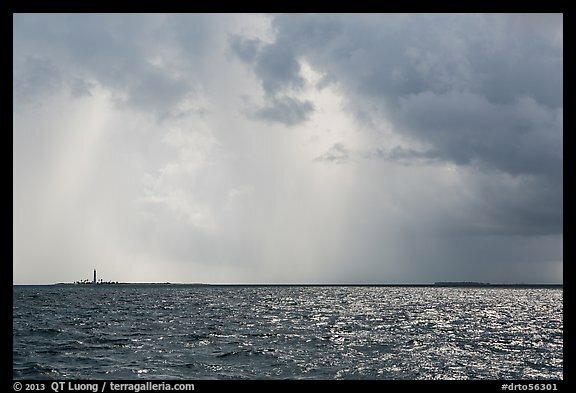 I was still planning to paddle solo to Loggerhead, but then I was fortunate that captain Glenn Patron, Gale, Ron, and Jean were also planning to sail to Loggerhead Key that day on their 50-foot sailboat Encore. I am extremely grateful to them for letting me ride along and for their kind hospitality on that day. On the way to Loggerhead Key, we did get hit by a tropical storm in the morning, and had to wait it out for more than one hour before we could dive the Windjammer. I was glad not to be on the water by myself since I am not sure I would have had the fortitude to continue in those conditions. Like the other keys of the Tortugas, Loggerhead Key is almost entirely covered in sand, with little arable land, so the vegetation is desert-like. 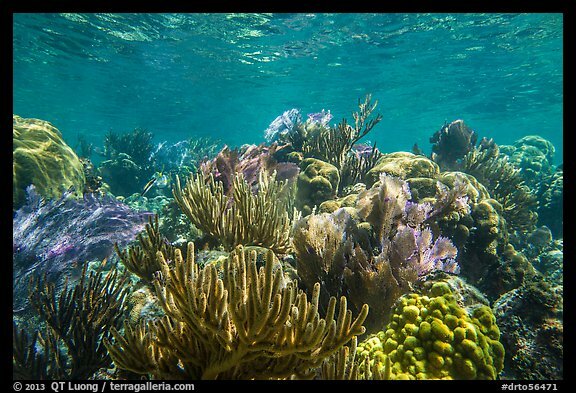 There are also long and totally deserted beaches, but the main draw of Loggerhead Key are its outstanding reefs. 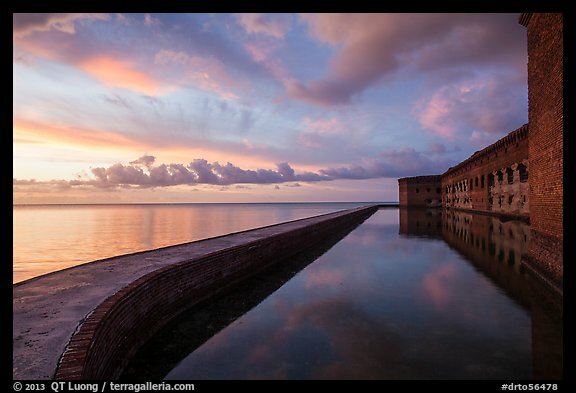 The total surface area of Dry Tortugas National Park is 64,701 acres, but only 104 acres are above water. This means that the park is more than 99% water. While winter is the popular season in Florida because of the cooler temperatures, lack of oppressive humidity, rain, and biting insects, summer is the better time for underwater activities, because the water is warmer, calmer, and clearer. 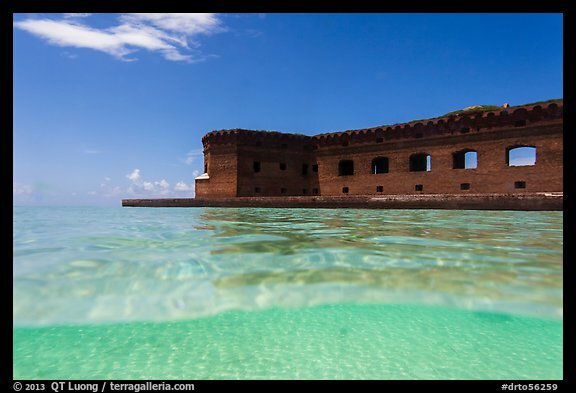 I thought that a split-image would illustrate best the idea of the improbable Fort Jefferson rising out of pristine tropical green-turquoise waters. I photographed at mid-day so that more light would penetrate the water. To execute such an image, you need to have a large contact surface between optics and water. The Nikonos I previously used doesn’t work for this. This time, I had a 5Dmk2 with a 17-40 and a +2 diopter inside an Ikelite underwater housing equipped with a 8-inch dome port. 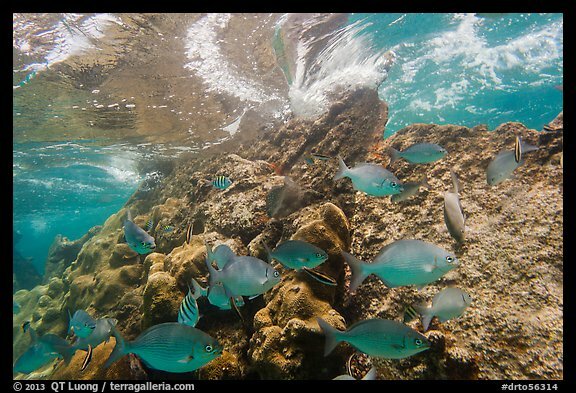 The reefs of Dry Tortugas lie in the Gulf of Mexico, at its juncture with the Atlantic Ocean and the Caribbean Sea. The intermixing of those three ecosystems results in a one-of-a-kind collection of marine life which is totally protected in the National Park and quite undisturbed because the remoteness of the location. Just outside the fort seawall, the snorkeling is already good, with an abundance of corals visible as you stroll the seawall, and it gets more interesting as you swim away. The best snorkeling in the park is found in two sites off Loggerhead Key. The Windjammer is the most popular dive site in the park. It is the nickname of a three-masted ship that wrecked on Loggerhead Reef in 1901 and since then has be resting in shallow water. 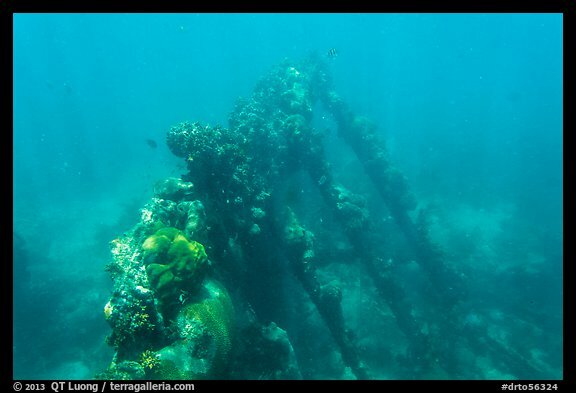 The structure forms an artificial reef attracting a host of fish from small tropicals to huge jewfish. The maximum depth is 20 feet, with a small piece of wreckage breaking the surface, making the site also suitable for snorkeling. 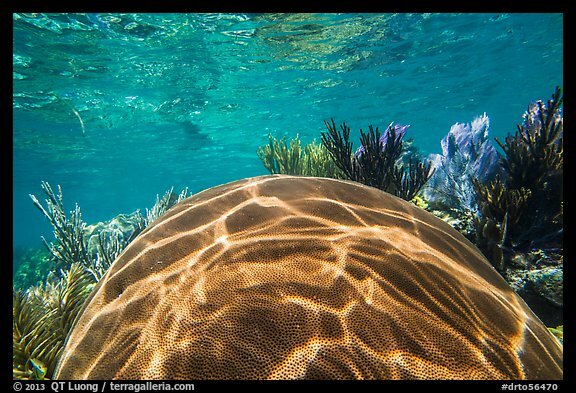 I wished I had scuba gear, since photographing while free-diving is much trickier with a large camera housing, however for logistical reasons, the only practical way to scuba dive the Tortugas is to come on a live-aboard diving boat. 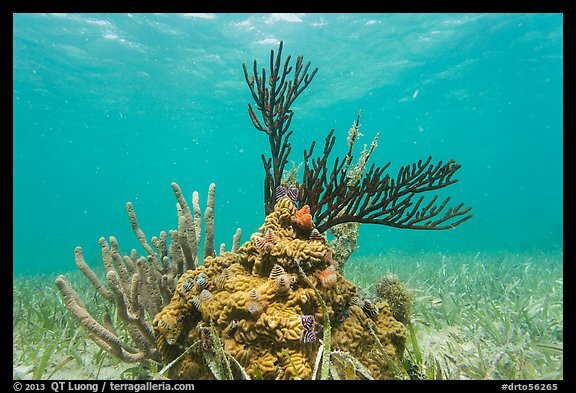 Located off the north side of Loggerhead Key, and easily accessed from the beach, Little Africa Reef (named for its shape), is protected and calm. It had the densest concentration of corals at shallow depth I saw anywhere. I could hardly find any sandy spot to stand, and the water was so shallow than you had to swim in zig-zag in order to avoid touching the corals. The shallow depth made it possible to capture vivid colors, even without a strobe, which is always difficult to handle while free-diving. Our explorations of Loggerhead Key took an entire day. On my last day, I had to pack my gear to have it ready on the dock at 10:30, so the time went pretty fast. 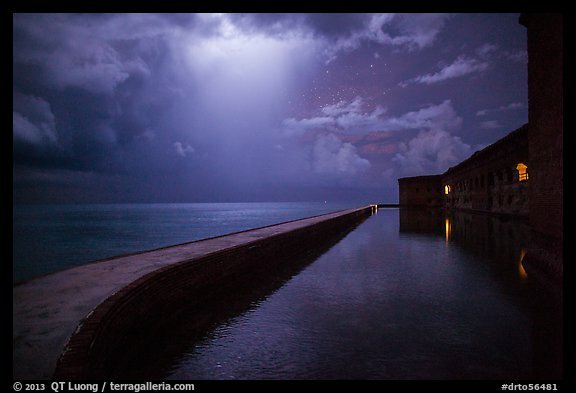 In retrospect, I wished I had stayed for the maximum of three nights allowed, as there were still spots on and around the island that I did not explore, even though at this point my gallery of pictures of Dry Tortugas National Park is already the most comprehensive on the web. Posted on August 22, 2013, 2:08 pm, by QT Luong, under New images.